Thank you for inviting me here today to speak. I want to first acknowledge that we're on the traditional territory of the Algonquin Nation and that's not just the polite acknowledgement. That's the very reason why all of you get to sit here today. Were it not for the cooperation, generosity, kindness, and political alliances, Canada wouldn't be what it is. Were it not for the peace treaties between our nations that are now constitutionally protected and form part of the foundational aspect of Canada, none of us would be sitting here today. I think that goes to the very heart of Bill C-51 and why I am opposed to it. Canada has placed Bill C-51 before indigenous peoples without any information, analysis, details on how it will impact our nations, any consultation, information or consent from our part. It is a gross violation of our nations to nation relationship. I don't have time to go through all of the technical legal details and problems with this bill except to say that I echo all of the concerns that have already been brought and will be brought by the thousands of lawyers in this country, security experts, former prime ministers and former Supreme Court of Canada justices. My main concern is how this bill will impact me, my family and indigenous peoples all over Canada and our treaty partners, other Canadians. Canada has a long history of criminalizing every aspect of indigenous identity. From the scalping bounties in 1949, which nearly wiped out my Mi'kmaq Nation, to the Indian Act, which has outlawed our culture, our right to educate our own children, and even excluded indigenous women from our communities. Every aspect of our identity has been criminalized, both historically and continues into present day. In every single instance, we've had to resist all of these laws, keeping in mind these were all validly enacted laws. It was legal to take Mi'kmaq scalps; it was legal to confine us to reserves; it was legal to deny us legal representation. All of these things were law in Canada. We had to be criminals as in, we had to break the law in order to preserve our lives, our physical security, and our identities. We are being faced with this very problem again with Bill C-51. Over the years, these laws have morphed into provincial and municipal regulations that deal with even our traditional means of providing subsistence—hunting, fishing, gathering have all been so criminalized for indigenous peoples that we end up skulking around in the forest just to be able to provide food for our families. 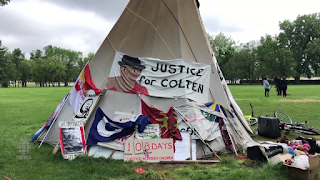 Every single court case that has been won at the Supreme Court of Canada has been a battle between indigenous peoples trying to live their lives and exercise their rights and identities facing some kind of criminal or regulatory charge. In every single instance, we have been labelled as criminals, treated as criminals, and one need only look at the current prison population to understand that this is still the case; not just the case, but as Howard Sapers, from the Office of the Correctional Investigator, has indicated, a “national crisis and embarrassment.” And why? Not because we're actually terrorists; not because we're more culturally predisposed to being criminals, but as a direct result of Canada's discriminatory laws and policies. There have been endless justice inquiries, which have pointed to the infection in our Canadian justice system of racism. The Donald Marshall wrongful prosecution inquiry, the Manitoba justice inquiry, the Ipperwash Inquiry, say that every aspect of our justice system, from the arresting officers, to the lawyers, to the judges, to the prison systems, overtly and systemically discriminate against indigenous peoples. That's our current reality. Bill C-51 proposes to take that to the last and final step. All we have left now, as indigenous peoples are our thoughts. Our private thoughts will now be criminalized. It will now be possible to be considered a terrorist for storing alleged terrorist propaganda on our own personal computers. My declaration of sovereignty, and I'm going to say it before Bill C-51 passes, I'm part of the sovereign Mi'kmaq Nation. That kind of material on my computer could be considered terrorism, a threat to national security because it's a threat to Canada's sovereignty. Welcome to the new terrorist. 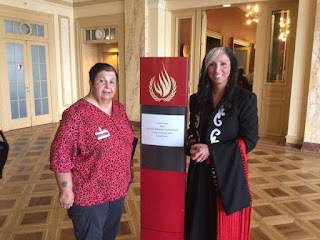 My name is Pam Palmater. I'm a lawyer, I'm a professor, I'm a mom, and I'm a social justice activist. I've won numerous awards for my work in social justice, women's equality, and children's rights but depending on whose radicalized view you speak of I have also been called a radical, bad Indian, eco-terrorist, enemy of the people, top-five-to-fear Canadian, dangerous militant, and Waco extremist. My biggest concern isn't how I'm presented in the media or by government officials, I'm stronger than that. My biggest concern concern is how this impacts me right now, the level of government surveillance for a law-abiding, peaceful, social justice activist, who's never been arrested or convicted of any crime. In my ATIP to CSIS they explain that they have a right to prevent subversive and hostile activities against the Canadian state which is why they have a file on me. However they don't offer me the courtesy of saying why I would be considered subversive or hostile, in fact everything I do couldn't be more public. In my ATIP to Indian Affairs they would not confirm that they monitor me. However they said they do conduct an analysis of me and my activities because I'm an active voice. That analysis comprised 750 pages of documents which tracked all of my whereabouts, what provinces I was travelling to, where I was speaking, and the dates and times. However they could not provide my security file because it was destroyed. When I attend gatherings, rallies, protests, or public and private events I often cannot make cell phone calls, send texts, or access my social media, my bank cards, or my credit cards. I can be at an Idle No More rally or protest and text my children but I cannot communicate with the very chief who has the same protest. This causes me great concern for my safety. How am I supposed to help ensure the comfort and safety of the people at rallies and myself if I can't communicate with anyone...and I don't have to remind this committee the staggering statistics and vulnerabilities of indigenous women in this country. I contacted the RCMP as well. They never responded to my ATIP, however individual RCMP officers at various events have confirmed that they were there to monitor me. At numerous protests I have been informed by RCMP and provincial police that I had to keep my protest peaceful. Sometimes they didn't identify themselves. At speaking engagements the host first nation would demand that any undercover RCMP, or Ontario, or other police officers identify themselves and in many cases they did. What's more concerning is the number of government officials that follow me around from speaking engagement to speaking engagement and often identify themselves when called upon to do so. Probably the most shocking is when I travel internationally in countries like Samoa, Peru, England, and Switzerland only to be informed by local authorities that Canadian officials are there to monitor me. That's very frightening in a country where I have committed no crime, but to advocate peacefully on behalf of my people. In the Prairie provinces the RCMP are very active. They will often call ahead to the University of First Nations where I'm speaking and ask them to identify what my target will be or where I plan my protest. This isn't just a problem for me. We've all heard about Cindy Blackstock and others. Skipping of course to what my recommendations are because I can see that I'm out of time. Bill C-51 must be withdrawn there is no way to fix it. There must be proper public information consultation, specific consultation for indigenous peoples, and a proper parliamentary study. Directing Justice Canada to rubber stamp the bill is compliant even if it has a 95% chance of being overturned in court is not democratic. We need an independent review body to report on the ongoing surveillance of indigenous peoples that will take complaints, do proper investigations, and offer redress. Finally, we're in desperate need of a special first nation advocate to be appointed for any and all court processes in all provinces and territories whenever applications are made in secret for court warrants. This person would be an amicus, a friend of the court who would be independent and can speak to all of the various constitutional and indigenous rights at stake. This is absolutely essential especially if Bill C-51 is to be passed. 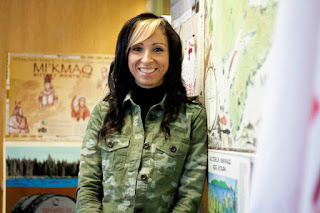 The Chair: Fine thank you very much, Ms. Palmater. *Taken from: Standing Committee on Public Safety and National Security Committee Meeting March 24, 2015 - Evidence #57 - Unedited Transcript Copy provided by House of Commons Canada.